Slack is the new hotness in team IM (instant messaging) tools. It is a great business communication tool that can greatly improve communication within your organization. Slack features the ability to add and remove people from an organization much like Github. You really only need one account. This works great if you have multiple projects going on at the same time, then you are able to login to all of them with the same account. Let's start with the most important part of any IM tool, Emojis! Slack has a great base of emojis and you can create custom emojis as needed. 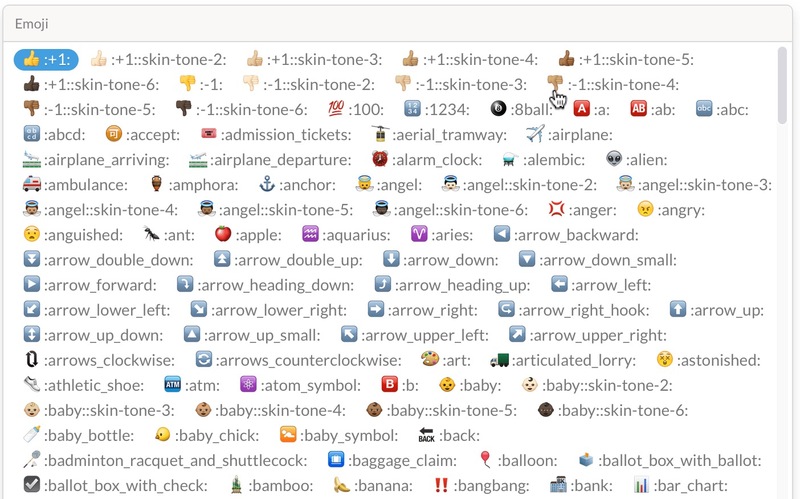 To autocomplete an Emoji in slack type : [tab] to bring up the list of emojis. For example, type in :smiley: to get the smiley face. You are going to look like a total noob in Slack if you use :) for a smiley face. Now that we got Emojis out of the way, we should learn to help ourselves. 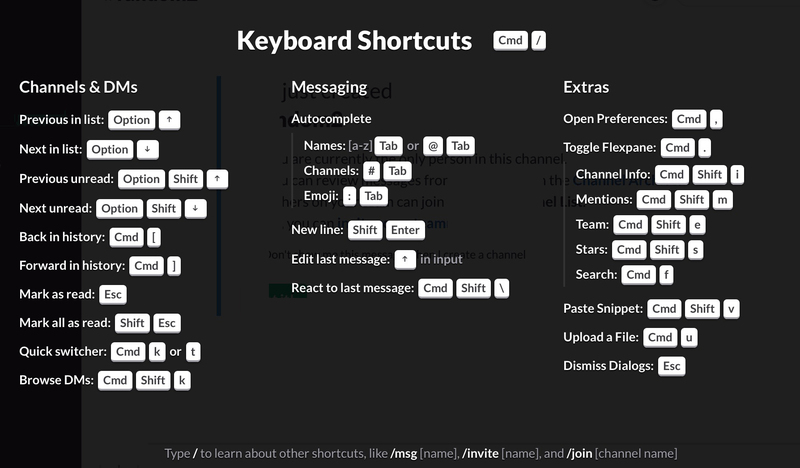 To show keyboard shortcuts type in ⌘ / or Ctrl / which depends on if you are on a Mac or Windows computer. There are several ways to share source code in Slack. For very short pieces of code, enclose the text in backticks, for example `var i = 10;`. Slack allows you to simply paste code into the message box but you won't get any formatting. If you want formatting you will want a "Code Snippet". Type in ⌘ Shift v or Ctrl Shift v to open the Code Snippet dialog. Slack shines in it's integrations support. Starting a video conference meeting is now trivial with Slack. Type in /appear, /zoom, /hangout, or /gottomeeting and you are off to the races. In the past starting a video conference was sooooo painful.